Steven Butala: Today, Jill and I talk about how there’s no place for emotion in real estate. Jill DeWit: There’s no crying in baseball. That’s what it sounds like. Oh, my goodness. Steven Butala: That’s true, too. There’s no crying in baseball. That’s Tom Hanks, right? Jill DeWit: Speaking of baseball, go Dodgers. Sorry, I had to get that in there. Steven Butala: Hey, before we get into the show, though, let’s take a question posted by one of our members on the LandInvestors.com online community. It’s free. As you’re listening to us, please drop your comments into the comments section below. Steven Butala: That’s what I do. Steven Butala: That’s what Jill does. Jill DeWit: Both. Yeah. It’s kind of a combination of both. You’re right, Kathleen, usually we’re pretty darn good. It’s pretty you. Steven Butala: This is a really good question. This is a fantastic question. Steven Butala: Yeah, if there’s that much talking at all. Jill DeWit: Right. Then they’re usually … When you explain that … Yeah. Remember at that mall that was supposed to be built out that area? That didn’t happen. Jill DeWit: They go, “Oh, that’s what’s going on.” Yeah. Often they know, you know? That’s the funny thing. They ask, it’s like we all ask. Imagine most people don’t walk up with a used car and look at it and expect … or like you say, Craigslist … expect that, “Well, that’s the price of the car.” We’re kind of trained to try to ask and maybe see if we can get a little bit better deal. I think that’s a little bit of what’s going on, too. I understand that. But, usually in the back of their heads, they know it’s vacant. They know there’s not much going on. They know that we might have a need for it, and they’re … But, they just start trying to ask. Steven Butala: True to form this is a great question. This is a … I can tell [inaudible 00:03:02] question. Here’s what happens in real life with Jill and I. We often change positions on these things. Like, a year will go by and I’ll assume the role of, “This is my final offer. Period.” Or, another year will go by and then Jill will assume that and I’ll be more flexible. Right now, we’re buying and selling a lot of houses and infill lots wholesale, and boy, Jill has taken a stance on pricing both on a the buy side and the sell side. Steven Butala: “You have to stop, essentially, being emotional.” I’m being the emotional one in these house deals. Steven Butala: When we get to the meat of the show, I’ll explain why, but she’s the one who’s just hard and fast about, “That’s the offer. Sign it and send it back. If you don’t like it, see if …” Send out more mail. Jill DeWit: Yeah. It’s too easy, as Kathleen knows. Steven Butala: All the stuff I’ve said over the years, it comes back to bite me with Jill. Steven Butala: Because, I’m the one who’s vigilant about real vacant land, but then when it comes to houses, I’m more emotional. I’ll explain why in a few minutes here. Jill DeWit: All right, let’s get to it. Steven Butala: Here’s the deal. I want this house thing to work. We have done tens of thousands of land deals. It works, and we continue to do them, and we continue to improve on it. So, I’m mentally over it. Steven Butala: The deals come in everyday, multiple deals. We have staff people that deal with it in an if then scenario. There’s no emotion in that at all. If it gets to my desk, my answer is probably, “No,” just because I’m tired of it. That’s the truth. Houses and some of these core infill lots, really urban infill lots that are expensive, because there’s so much money involved in the acquisition price and the sale price. There’s so much spread. We constantly are moving our minimum line from like 25,000 to 50 to 60. Now, we’re actually doing a house flip are now where we’re going to make … I don’t know … $125,000 on it. This is just wholesale. Steven Butala: I’m a lot more attentive and a lot more involved in say, “Well, I know I price it at $125,000, but if you want to sign it so we only make 50, I can live with that,” in an infill lot and a SFR standpoint. Am I probably getting too emotional? Yeah. Steven Butala: The basis of … In a few days, we will air a show called Our SFR $25,000 Mistake. We only made 25 grand on it. So what? And, why … It’s all tied to my emotion, and not Jill. There’s no place for emotion in any of this. Let the mail do its job. Let the people that you’ve put in place do their job. Remove variables and increase efficiency. Emotion is inefficient. Go ahead. Jill DeWit: You are always said, Steven … and you’re right … that we should be looking for properties, whatever property type, just like a line item. That’s what I do and I still do. Then it’s kind of funny … Thank you for sharing that. We have kind of flip flopped. I’ve gotten less emotional and more just accountant-like. It’s a line item. “Do the numbers work? Okay, yes. If not, move on,” kind of thing. Steven Butala: Yeah. It’s so inefficient. Jill DeWit: Or, “I would put a cabin here.” Or, “Wow, look at the view. I kind of want this property.” That’s my first … I was thinking about people that are real new. Got to be very careful. Don’t go down that path. If you start … That’s what I did. I trained myself that way. Not getting into the property, not looking at the property, not driving for dollars and trying to see something that’s not there. That’s another way of getting emotional that you shouldn’t do. Just really looking at like it’s just a number, and that’s it. Because of that … which is really kind of crazy, because I’m female. We know that. I can be emotional. We know that, too. But, I don’t get emotional about this. I’ve gotten good. It’s just business. Jill DeWit: I have no trouble … I think what helps me not being emotional, is I have no trouble saying no and walking away. None. Because, I know it’s a good deal. If I really want it, they’ll come back. I know that. There’s other times I’m like, “I don’t want it. I really don’t want it. I really am walking away on purpose. Don’t follow me,” you know? Seriously. It’s like you’re haggling. Steven Butala: That’s when they do follow you when you do that. Jill DeWit: You ever been like you’re in Tijuana and you’re haggling, and you’re like, “I really do not want more margarita glasses,” and they’re following you down the street practically giving them to you. You’re like, “No, I really don’t want them. This is not a ploy to get you to my price. I really don’t want them.” Yeah, can’t get emotional. Steven Butala: Here’s a trick that I learned a long, long time ago. It’s served me well forever. I think of everything in terms of an income statement and a balance sheet, and I make decisions that way. There’s a reason that there’s so many accountants … former accountants or recovering accountants like me … who go on to own businesses. You know what? I notice salespeople are business owners, also. It turns out Jill is a professional salesperson, and I was a professional accountant, and look, we own these businesses now. For some reason those two personality types … albeit, go at things totally differently … end up being good business owners, successful business owners. Steven Butala: I walked into a McDonald’s one time when our number three kid was real little, and I started … We played the income statement balance sheet game when he was little. He loved it. Jill DeWit: How do you play? Steven Butala: Okay. You walk into a McDonald’s … or a fast food restaurant, I probably should say that. Steven Butala: I know I should. Steven Butala: You look around as a fast food chain owner and certain things fall on the income statement and certain things fall on the balance sheet: the restaurant itself, the physical plant, the stuff that they cooks with, the machinery. That’s all balance sheet stuff you got to … There’s an asset value and a liability value and depreciation. There’s things involved. What’s on the income statement, which is profit and loss statement? Income statement and profit loss statement are exactly the same thing. They’re synonymous. What cost if it’s sold is, like the actual so-called meat that’s in the product, the buns, all the paper products. You could argue that those are on either side, but pretty quickly, we can sit down and even … He was little then. An eight-year-old can figure out the stuff that’s assets and liabilities in the stuff that’s in the income statement that makes you money. Steven Butala: I look at real estate like that, and I look at every decision I make. Just before we sat down here … because, I have a meeting later with our IT department … I ranked our highest, most profitable, most used websites in order of revenue. We are literally going to eliminate several websites that they just don’t produce the money. We’re spending a lot of time and resources managing a lot of websites, and we’re going to remove probably half of them. It’s won’t affect … no one should freak out. In fact, the chances are you don’t even know that they exist, which is why they’re not making any money. Jill DeWit: Exactly. They’re just hanging out there. It’s silly taking up our resources, and we don’t need them. Steven Butala: It’s not that they failed. Steven Butala: It’s just that we haven’t put the marketing time in, or the developing time in, or the user ability of the websites and taken them to a point where they should go. A great example is TitleMind. Jill and I started an escrow company about a year ago called TitleMind. For a lot of reasons … most of it has to do with our personalities … it just didn’t work. We’re not that interested in doing other people’s deals. Jill DeWit: It’s a lot of work. Yep. Steven Butala: We are, however, really interested in doing our own deals and teaching. There are our two main focuses, and then providing some tools like Offers 2 Owners and ParcelFact. Those are the two main tools that are making the cut, because people use them and love them. Steven Butala: What is it with all these websites, and what … Because, I got emotional. I had this plan. There’s only eight hours in a day, 10 hours in a day. Steven Butala: 15 hours in a day. Jill DeWit: I’m excited. This is really good. Steven Butala: Jill’s had it, by the way. We just got off of these two live events. Both of us had laryngitis for a week, which is probably good for our relationship. Jill DeWit: Yeah. Thanks a lot. Jill DeWit: No, that’s really helpful. Steven Butala: Our relationship’s truly improved because of that. Jill DeWit: Yeah. I like it. I win, too. Steven Butala: If you can’t hear well and you have laryngitis, you have a happy spouse. Yeah. Jill DeWit: And, I can’t smell, so throw that in there. We’ve got it all covered. Steven Butala: Jill’s been happy for a week, because I can’t talk or hear. Jill DeWit: Yeah, it’s nice. Jill DeWit: It was fun. What did we call it? Meth murder cabin. Steven Butala: … a meth murder cabin that was incredibly inexpensive that I wouldn’t have purchased for five grand. Jill DeWit: We all realized that’s why. I have a great picture. I’d love to pop the picture up of it right now. It’s crazy. Meth murder cabin. Steven Butala: That’s what kids called it. Meth murder cabin. Steven Butala: Well, you’ve done it again. You’ve spent another 15 minutes or so listening to the Land Academy show. Join you next time where we discuss the top three deal killers. Jill DeWit: And, we answer your questions posted on our online community, LandInvestors.com. It’s free. Jill DeWit: That was funny. That was good. Hey, I want to share something, because today people don’t know. Check out on Wednesday. I’m doing a new show every Wednesday 2:00 Pacific time. It is me. 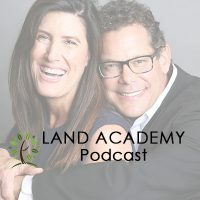 For the first 15 minutes, I cover a topic of whatever you want to talk about, and the second 15 minutes I answer any questions you want to know about getting into real estate, flipping land, what we do. Everything from my perspective to help you get going. Steven Butala: When is it? Jill DeWit: Wednesdays, 2:00 Pacific time. Jill DeWit: Facebook Live, and soon to be also on YouTube Live, but definitely Facebook Live for right now. Also, just so you know, I have a special promotion going on. Spooky is the coupon code. Get you $600 off if you want in. Jill DeWit: Share the fun by subscribing on iTunes, or on YouTube, or wherever you are watching or listening. Like us and comment on what we’d like you to see in future shows, and please rate us while you’re there. We are Steve and Jill.